Putin gets his fair share of flak from the West for being, well, a bit overbearing. But whether you’ve got a love or hate relationship with VVP, you’ve got to admire a president you could confuse with a rock star. Sure, there are those consistently sky-high approval ratings, but beyond the politics, he’s got some obsession-level fans. Here are 13 of the most inspired displays of Putinalia (no, not as nasty as it sounds: it's just Putin + paraphernalia) that Russia has gifted to the world. Desire to be inspired? Your feel-good slogan isn’t complete without an iconic Putin snap to match. That’s what Putinspiration’s all about. That was your treat for the eyes, and now one for the ears. Among the musical masterpieces composed in Putin’s honor is “Такого как Путин” (“Someone like Putin”), a smash pop hit from 2000 by two little ladies who claim they need just such a man in their lives (note the doppelgänger). There’s also “ВВП” (yes, his initials are “VVP”), which is just about as catchy and doesn’t leave any doubts about where to send your thank-you card for the salvation of Mother Russia. Hungry? Too bad: there may be a statue of Putin made entirely of chocolate, but he’s the only one allowed to eat it. But if staring at choco-art won’t satisfy your sweet tooth, there’s always Putin ice cream. That’s the name, not the flavor, in case you were wondering. Need to mask your musk? Feel like Putin on the ritz? Try some Leaders No. 1, the new perfume "Inspired by Vladimir Putin." Nothing like the smell of the executive branch to give people a whiff of your ambition. If you're craving a Putin for all occasions that a tshirt or plastic bust just can't provide, that's where the calendar comes in. Best part is, when you make it through the year you'll have twelve professional-quality portraits you can frame and hang on your wall. What else does VVP stand for? Volumetric Vladimir Putin, of course. Thanks to a portrait with his features superimposed in 3D, the visually impaired can also get a feel for the president. Nashi (“Ours”), a youth movement pushing pro-Putin politics. It’s not just a fan club (though there’s one of those too); it’s a political group. And don’t worry: of course there’s a movie about it. It’s called Putin’s Kiss. There’s no better way to celebrate a good crop than naming your new strain of tomatoes after your fearless leader. The “Vova Putin” goes great in salads, sandwiches, and requests for govnerment funding for agriculture. There couldn’t not be a Putin-brand vodka. It’s called Putinka – what could be catchier? Russia may have a problem with alcoholics, but at least they’re politically engaged alcoholics. “Vertical power kebabs,” the specialty of Chelyabinsk’s Bar Putin, whose other forte is patriotic food names. And on that note, if all that kebab meat is making you thirsty, the same spot’s got “When Vova was little” milk drinks. Just try ordering a trayful of those in a hurry. 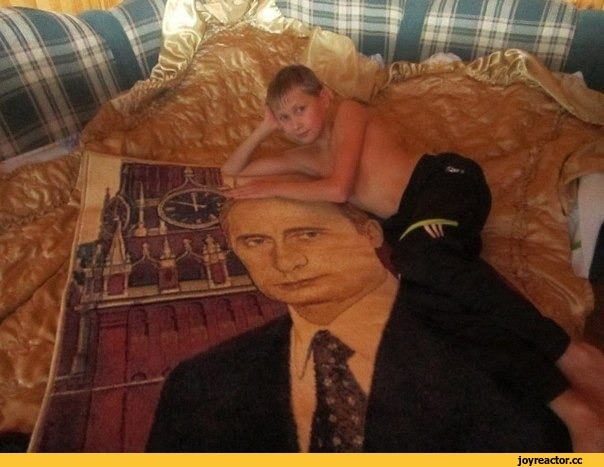 Even when he's in the form of a rug, no one's about to be walking all over Putin. This commander-in-chief carpet was made for better things. Specifically, showing the world how to lead a country and inspiring near-maniacal fads at the same time. Now that's politics.